I'm loving all of these children shows being developed from children's books! I reviewed the first episode of Pete the Cat a looooong time ago, and unfortunately haven't watched the rest of the show yet! It's one that I feel like I should watch with my son, but he'd rather watch the same episode of Paw Patrol for the hundredth time - anyone else have that problem? I'll probably watch several of these Amazon Prime and Netflix kids' shows on my own, and just let him sit in if he wants. One we can both agree on, however, is The Stinky and Dirty Show. 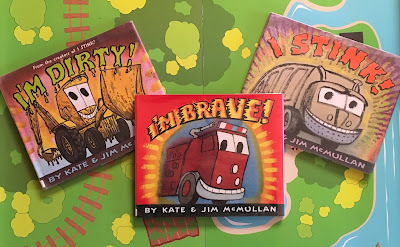 This show is loosely based on books by Kate McMullan and Jim McMullan. It's such a cute show, with the catchiest theme song ever. I love how childlike the characters are, and how full of wonder they are. Stinky and Dirty (from I Stink! and I'm Dirty!) are the main characters, but Brave and Mighty have their own books, too. I love hearing the voices picked for the characters on the show. Billy West (Futurama), Wallace Shawn (The Princess Bride), Tom Kenny (SpongeBob SquarePants), Jane Lynch, Andy Richter, Joan Cusack, and Whoopi Goldberg all voice characters! Mostly I just love that the two main characters are children. When I read the books aloud, I automatically use a tough voice because the stories are all about showing that different vehicles can do. I read it as a "You don't think I can do this? I'll show you," attitude. Hearing the friendly tones of the show made me wonder if I was totally misreading the books! I might have been reading the book characters a little rude - whoops! There are already two excellent seasons of this show, and my son and I are both excited to see more! The stories are really cute, and I love the animation style! It's pretty true to the book illustrations, but just looks amazing on screen. Have you watched The Stinky and Dirty Show? Have you read the books? What did you notice that was similar or different?